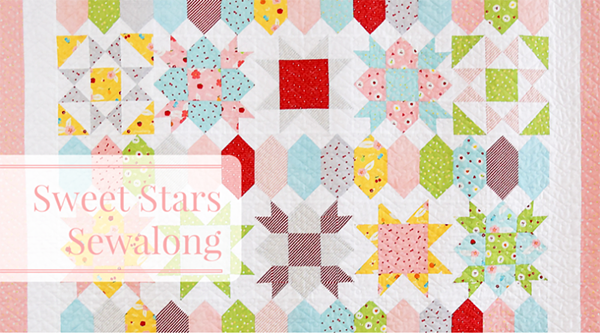 Today I'm the guest blogger on the Sweet Stars quilt sew-along, hosted by my lovely friend Peta from She Quilts A Lot who designed this quilt. You guys should recognise it - it was the star of the show in my Sweet Orchard booth at the spring quilt market in Salt Lake City. Here's a photo of me and Peta in front of it - we had to travel all the way from Australia to Utah to finally meet in person! 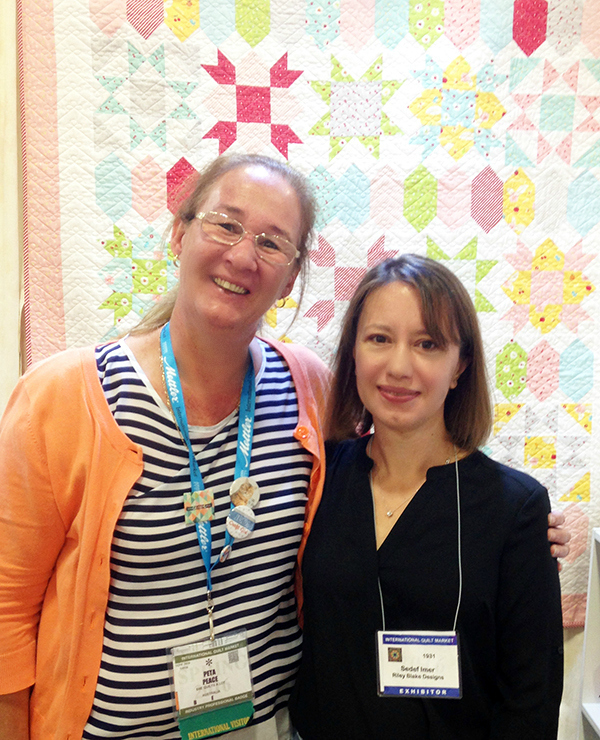 And she is not only a terrific quilter but also a lovely sharing person with an incredible dry, Aussie sense of humour - we had a blast together in SLC! 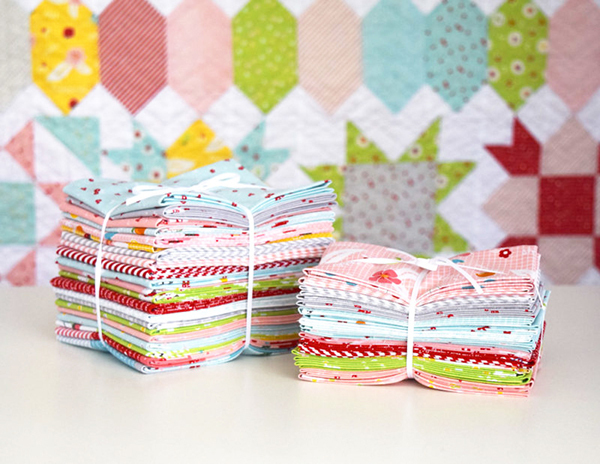 The Sweet Stars sew along kicked off just a couple of weeks ago (so there is plenty of time to join in!). 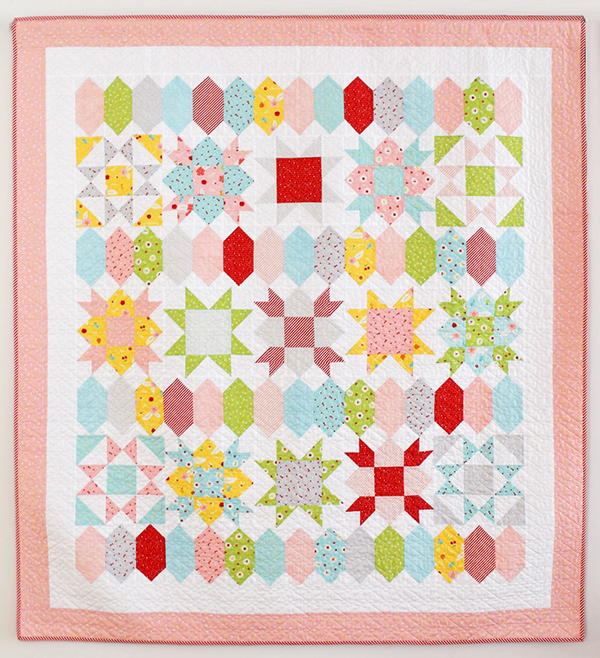 There are a number of blocks in this quilt which have 'easy corner triangles' - in other words a triangle on the corner of a segment - such as in the diamond blocks, and the flying geese squares and rectangles. Today I am going to make a diamond block to show you my easy corner triangle method and how I get perfect, crisp results every time. Step 1. Starch! Starch your fabric before you cut out your block segments. I cannot emphasise how important this is - your precision will improve tenfold when you are working on starched fabric. 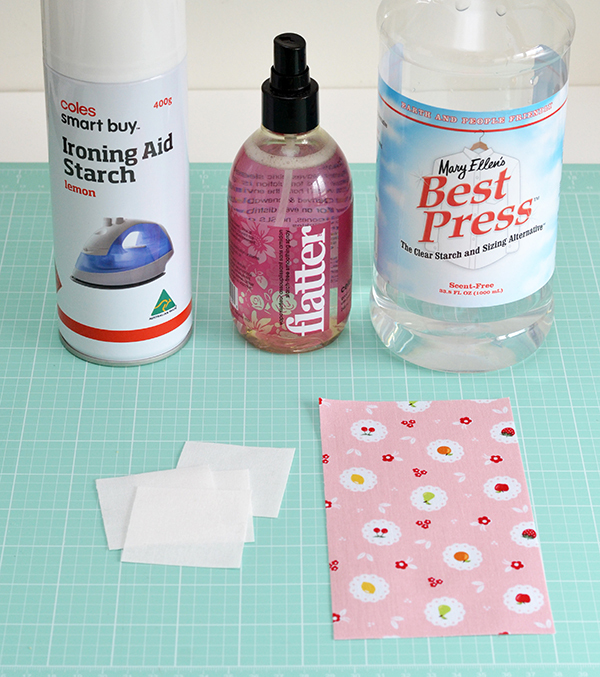 You can use specialist quilting sprays such as Best Press or Flatter (which I love! ), or if you are on a budget just ordinary supermarket starch will do too. I have tried a variety of starch sprays from my supermarket and prefer their cheapest one as it doesn't leave stains like some of the more expensive brands can do. Step 2 - Trace a diagonal line. Draw a line from corner-to-corner on the back of your corner square pieces. 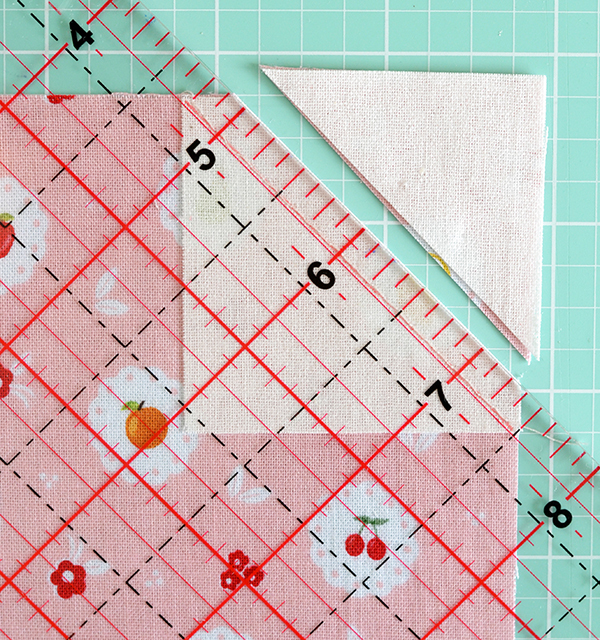 To do this place your quilting ruler on the square and align the 45 degree angle line along the top edge of the square, as shown in the picture. Note how I have positioned the ruler just 1mm to the left of the imaginary line going from one corner to the other - this is to allow for the thickness of the Frixion pen nib so your drawn line connects your corners precisely. I use Pilot Frixion pens for marking lines such as this which will be hidden in seams - you can use a pencil or a different quilt marker if you prefer. Step 3 - Position & Sew. 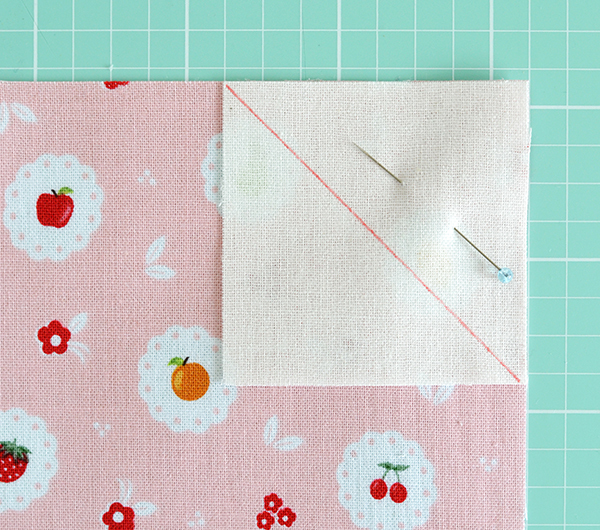 Place the square on the corner of the pink fabric right sides together and pin, then sew along the drawn line. When sewing, bear in mind the weight of your thread. 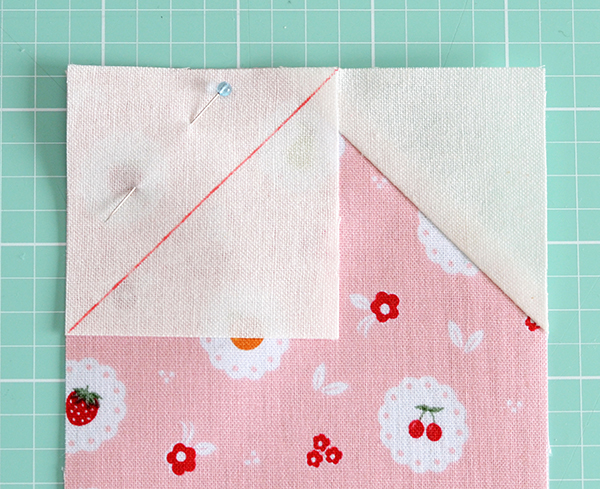 If you are using 50 weight or heavier thread you may want to sew a fraction of a mm to the right of the traced line to allow for the thickness of the thread, so you get a precise result when you fold the 'wing' over later. 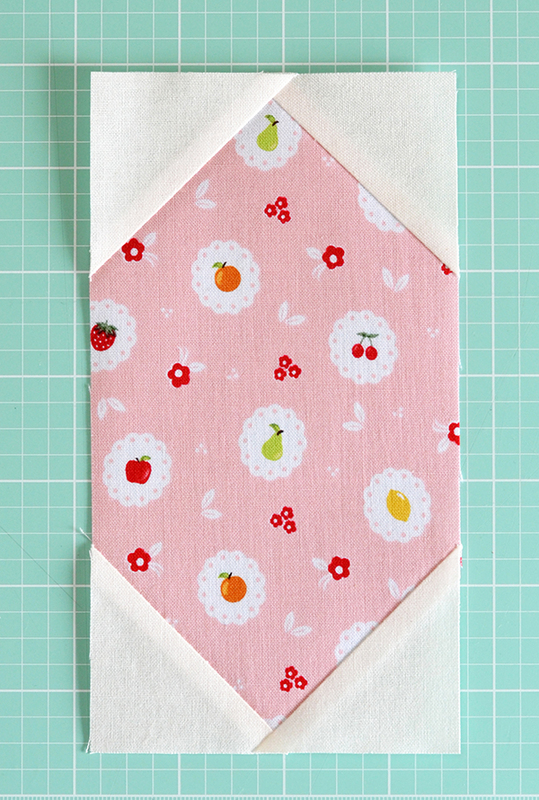 Tip: If you are sewing corners onto a large number of segments, I recommend chain piecing these i.e. sewing a corner onto a piece of fabric, then without breaking your thread sewing a corner onto the next of piece of fabric, and so on, so you end up with a long chain of pieces with one corner sewn on. Snip the threads, then repeat the process for the next corner on each piece. Step 4 - Trim excess. Trim the excess material approximately 1/4" away from the seam. Note the positioning of my ruler - I use a scant 1/4" allowance for this so the seam doesn't show when I fold the fabric over in the next step. Step 5 - Fold over & Press. Fold the 'wing' over and press towards the triangle. See how precise the corner triangle is, perfectly aligned with the edges of the pink fabric. Repeat the steps above for the other corners to complete the diamond block. And that concludes my little tutorial! 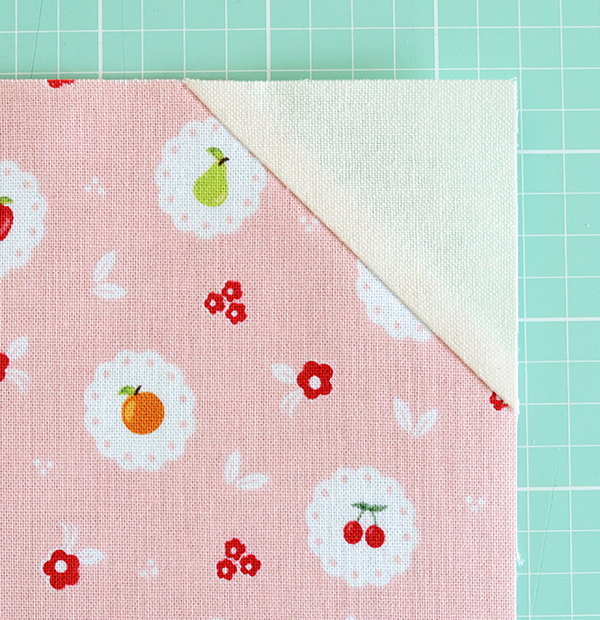 You can find a full schedule of the sew-along on Peta's blog, and info about how you can win a bundle of my Sweet Orchard fabrics also (courtesy of Riley Blake there are two prize bundles)! 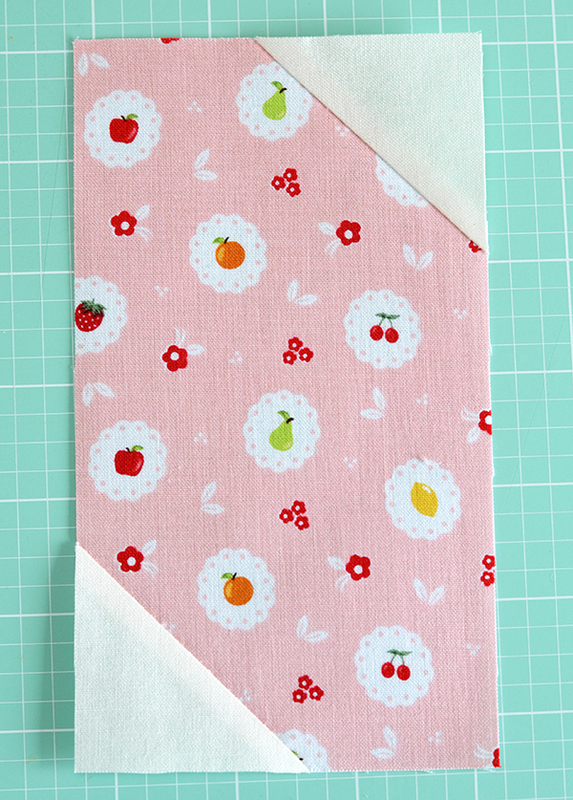 If you would like to join the sew-along, there are quilt kits available including the pattern and my Sweet Orchard fabrics. 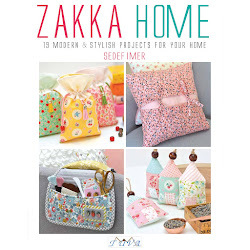 You can order these from Fabric Pixie and Fabric Patch in Australia, and Fat Quarter Shop in the US. Please use the hashtags #sweetstarsal and #sweetstarsquilt if you post photos on social media, so we can see everyone's progress! This fabric is adorable. I am very happy to read this instructional for corner triangles. This works great! Those are very pretty blocks. This technique reminds me of making flying geese which I'm weak at making. Thank you for this help!